The 50,000 hectare Coorong National Park begins 150km south of the capital Adelaide in South Australia. It was declared in 1966 to conserve the distinctive landscape, coastal dune system, lagoons, wetlands and coastal vegetation and the great variety of birds, animals and fish that live in or visit the area. As a habitat for numerous species of migratory birds and as a refuge for birds in times of drought, the Coorong is important in a national and international sense and is included on the list of 'Wetlands of International Importance'. The Coorong is also an archaeological site of national importance giving evidence of Aboriginal occupation over many thousands of years from the peoples of the Ngarrendjeri Nation. Taken together, these factors account for the Coorong National Park's significance in regional nature conservation and recreation and for its special importance as an area of national and international biological and heritage significance. ..no, the Coorong is popular for entirely different reasons. March 1987 was my first ever DXpedition with the now defunct Southern Cross DX Club in South Australia. Since then the club was constantly on the lookout for new locations to conduct DXpeditions with a focus mainly on tropical band DXing as there weren't many members interested in serious medium wave DXing. Over the ensuing five years the club ventured to numerous locations within a 100km radius of the capital Adelaide only to enjoy minor success in DXpedition results. This all changed in 1992 when a fishing shack owned by the Strathalbyn Fishing Club in the Coorong came to the attention of club members Leigh Morris and Steve Perkins. The shack at the Coorong was modest yet perfect for the needs of DXers. It was located on the waters edge with facilities such as electricity (not too noisy usually), 2 kitchen tables, chairs, kitchen, fridge, running (slowly) water, shower (luke warm at best - but it took the chill off the cold water) and a separate room with enough beds for 6-8 DXers. It even had a TV antenna, so on a long summer DXpedition we could bring our TV and get fuzzy reception of the cricket matches. The shack was the last one in a row of half a dozen or so. This meant we had no problem running long beverage antennas out in an arc that covered the Middle East through to Europe/Asia. The length of such wire was limitless and the longest one that Dave Onley and I put out one summer was 1100 metres (3600 feet)!!! Shorter wire could be put in the direction of USA but the length was usually no more the 60 metres (200 feet) and didn't really work that well except for a couple of occasions. The fishing shack was located only ~20km from the town of Meningie which had all the required facilities: pub, petrol station, pub, mini-mart, pub, fish 'n' chip take-away and pub - on occasions we would frequent the local pub. The regulars to the Coorong from South Australia included myself, Steve Perkins, Lew Chapman, John Smith and Leigh Morris. Once word had gotten out about the MW potential of this site, it wasn't long before Victorian DXers Dave Onley, Dave Headland and David Martin became regular visitors also. 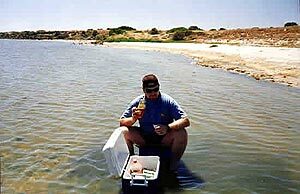 Dave Onley and I made an annual week long summer pilgrimage to the Coorong for a week of DX and drink in 1994, 1995, 1996 and then for one final fling in the summer of 1999 - this was the last time either of us listened from the shack. An early visit revealed a sneak preview into what was about to come. It was June 1993, from memory my first trip to the Coorong where good signals were heard from VOA Rhodes 1260, DW Malta 1557, SR Germany 1422, Vatican 1611 and WDR Germany 1593. This certainly was encouraging to see these Europeans on MW punching through to be heard in Australia. 1988 saw virtually the end of MW DXing in Australia as all ABC stations became 24 hours. It spelt doom and gloom as almost every 9kHz split frequency was now occupied and made reception of Asia, Middle East, Africa and Europe in the wee hours of the night and morning extremely difficult. So much so that most seasoned MW DXers either stopped altogether or severely reduced their MW DXing. Fortunately for me I only really started MW DXing in 1987 and so by the time this event happened, my interest levels were still high and I continued on. Fortunately so did Dave Onley and we spurred each other on in this specialised field of the hobby. So while these catches were ho hum 'regulars' in pre 1988 days, they were certainly exciting in 1993! Plans were already afoot for another DXpedition at the October long-weekend just four months away. It's rare to remember DX sessions from 10 years ago but I have no problem with this one. October 1993 was the DXpedition that put the Coorong on the map as a genuine spot to hear European MW DX in south-east Australia. The short 3 day DXpedition produced Turkey 162, Morocco 171, Sweden 1179, Yugoslavia 1269, Czech Republic 1287, Spain 1359, Germany 1422, Albania 1458; Austria 1476, Germany 1539, Moldova 1548 and the Vatican 1530! This was an exciting time and I couldn't race to the phone fast enough when I got back to Adelaide to let Dave Onley know that it was time to get over here ASAP. Unfortunately the path to Africa was never explored because within 20 metres of going on the required bearing we would hit water (saltwater). Even attempts to run wires over the water supported by tomato stakes proved useless. So apart from North Africa, the only sub-Saharans to make it through were VOA Botswana 909; Mayotte 1458; Reunion 666; Kenya 1107 and 1386 and VOA Sao Tome 1530. This was before the days of the EWE antenna's popularity. With Europe only possible in the early morning, it left us with not much to do in the afternoon and evening. At local sunset Australian DXers focus on the Pacific and North American stations. However the Coorong wasn't known for this, firstly because South Australia has traditionally been very ordinary for this area and secondly because no decent length antennas were possible. We would usually occupy our time chasing Queensland commercial stations, especially the low power ones which had sometimes up to four other stations fighting it out. This was done without phasers and a couple of my favourite catches at the Coorong were 4BU 1332 and 8HA 900 of all things. However on occasion some west coast North American stations would appear and I have heard and verified from the Coorong KFRE 940, KTWO 1030, CJME 1300, CFUN 1410 & KXEL 1540, but this has only occurred rarely (this was before the X-band days too). An hour after sunset there were openings to Japan and the Philippines which would occupy our time. We would normally stay up and gauge Asian conditions until around midnight. If nothing much new was around from Indonesia, which was usually the case most of the time, we'd go to bed for a few hours ready for the 330am wake up call. There was one distinctive occasion where conditions were very different than normal. We noticed one evening that signals from the Philippines were coming in much earlier and a little later were very strong. Quick checks of Indonesian marker stations on 630 RRI Ujung Pandang; 855 RRI Medan; 909 RRI Sorong; 999 RRI Jakarta & 1206 RRI Denpasar revealed that something funky was going on. Usually on any evening 2 or 3 of these stations would be fading in and out with the Aussies, but on this evening they were all there and solid. A bit more tuning revealed heterodynes on off channels like 1535 and 1591, so much so that they became more regular and stronger over the ensuing 30 minutes. Dave and I looked at each and dived into a listing of off-channel non-RRI stations. This was before the days of Bruce Portzer's Pacific-Asia Log unfortunately! Over the next couple of hours we'd driven up and down the band as fast as possible, which is tough to do as we were both using Drake SPR4's. We were looking for hard to hear RRI stations and off channel Indonesian commercial stations and pirates. This is where we coined the phrase 'panic tuning'. What do you do, stay on a strong off-channel het and hope for audio or do you go for a hard to hear RRI outlet where there's a good chance of sending a report and maybe a QSL? What's a DXer to do? Certainly the highlight of that experience was being lucky enough to receive QSLs from RKPD2 Blitar 950 kHz & RSPD2 Situbondo 1363 kHz, both in the 400watt range of transmitting power. The problem was we were discovering off 9kHz split commercial and pirate stations that simply were not listed!! This situation lasted a couple of hours as sunset swept over Indonesia. Eventually the strong hets began to disappear in the mush. A check of 1134 revealed that All India Radio in Calcutta was coming in. While not a super rare catch, AIR 1134 is tough to hear at the Coorong because local 5MU on 1125 khz (5kW) and only ~60km away and 3CS Colac on 1134 puts in a mighty strong signal too. So we scoured the bands for some elusive Indian outlets. For some reason India has never propagated well to the Coorong except for AIR Nagpur 1566. Fortunately we managed to land 1530 Agra and 1305 Parbhani with the General English Service news bulletins and so these happily sit in the QSL album now. It's not often that an Asian evening outdoes a European morning, but this one certainly did. So this DX session didn't fit the regular Coorong pattern. Normally by 4am the first signs of European action would appear. We had a pattern, if by 4am you could get early audio from Ukraine 1431, SR Germany 1422 and Vatican 1611 then it would be a good morning. The beverages to Europe would inevitably point to South East Asia. So even on the few occasions where there were no European openings, we would occupy our mornings chasing the Philippines, Japan and Indonesia. Interestingly most of our DXing was done in the summer months. This was certainly not for any theoretical reasons, it's just when we had time off from work and study. Listening was either done in the October long-weekend or for a week or so in January. It would have been interesting to see what was available on the band if more winter DX sessions were done. As with all hobbies the interest wanes at times and we tend to get side-tracked with other pursuits. My DXing abruptly stopped in early 1997 as my girlfriend, then fiancé and now wife came on the scene. 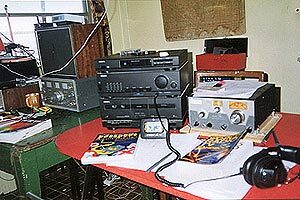 The next time I turned on the radio was interestingly as Dave and I did our final DXpedition to the shack in January 1999 (right after my engagement party!!!!). Since then the Coorong DX gang went their own ways as the fishing club shack was bought and is no longer for hire. The Victorian DXers didn't venture over again and Leigh Morris and John Smith drifted out of the hobby. 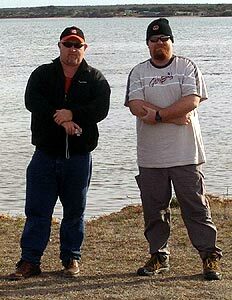 Steve Perkins and Lew Chapman continued their DXing but from other sites with not much luck on MW. As for me, my SPR4 was switched off in January 1999 and was not turned on again until my wife and I moved for a year from Adelaide to Townsville in early 2004. After a solid 10 months of DXing in Townsville that included 8 DXpeditions, there was no way I was giving up DXing when we returned to Adelaide to live again. There was a sign from the DX Gods when I landed a job in Murray Bridge, 100km away from our home in Adelaide. It was in fact 100km in the direction of the Coorong, at work I was only 70km away from Meningie. Needless to see it wasn't long before I investigated some future DX possibilities. 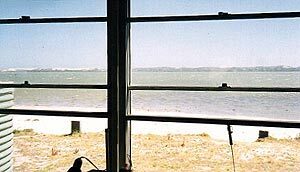 So with the shack now unavailable it means that new and exciting adventures will now occur at the Coorong DXing from all sorts of places like caravan parks, car, tents and hopefully some established shacks. This all depends on our enthusiasm and commitment to the hobby. With the solar minima approaching this is our opportunity to capitalise on this wonderful DX location once again. I urge you to visit the DXpeditions page over the next few years and have a look at the adventures which myself, Dave Onley, Steve Perkins and Lew Chapman hope to have at the Coorong once again. Check out our early fact finding mission report as Dave Onley and I attempt to reincarnate the DX ghosts of the past to discover a new Coorong DX site. The first official Coorong reunion DXpedition for 5 days has now occurred and you are welcome to check out the report. It has made us put up the theory for Coorong DXing - Summer = Europe while Winter = Africa. Only time will tell.